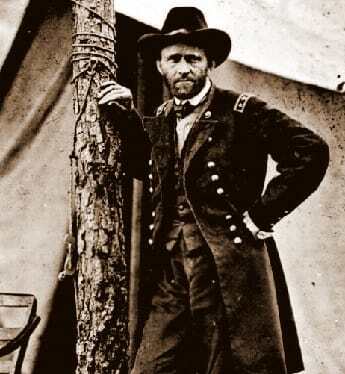 Early in his life and military career Hiram Ulysses Grant (Ulysses S Grant) was not the type of man who you would expect to become a great military commander or president of the United States of America. He was at best an average West Point Military academy student and later failed at numerous business ventures. However; Grant did indeed become one of the greatest and most famous American Civil War generals and went on to become the 18th president of the United States. The list of interesting facts below will be of interest to both kids and adults alike who want to learn how and why Ulysses S Grant accomplished such great things. This information serves as a short concise biography and timeline of this great man with a focus on his military leadership during the Civil War. Click here for a great selection of Amazon.com books about General Ulysses S Grant. He was born in Point Pleasant Ohio on April 27, 1822. He married Julia Dent in 1844. He met her in St. Louis Missouri where he was stationed after graduating West Point. They would have four children together. Grant served two terms as president from 1869 - 1877. General Ulysses S Grant died from throat cancer on July 23rd 1885, he was 63 years old. Well over 1 million people attended his funeral in New York. At the age of 17 he entered the U.S. Military Academy at West Point. He was an average student graduating in 1843 21st out of 39 students. Grant served in the Mexican-American War (1846 - 1848) where he was able to learn valuable military skills from generals Zachary Taylor and Winfield Scott. After the Mexican-American War he was assigned to military post in the western U.S. away from his family. In 1853 Grant resigned from the military amid accusations of heavy drinking. This led to a low point in his life where he struggled to support his family. With the outbreak of the American Civil War in 1861 Grant volunteered for military service. He was put in command of the 21st Illinois volunteer regiment. In February of 1862 under Grant's command Confederate Fort Henry and Fort Donelson were captured. It was here that he earned his nickname "Unconditional Surrender" Grant. This prompted Abraham Lincoln to promote him to major general of volunteers. In April of 1862 Union forces, under Grant's command, defeated the Confederates at the battle of Shiloh in Tennessee. On July 4th 1863 after several attacks and a long siege Grant captured the strategically important city of Vicksburg. In October and November 1863 Grant launched the Chattanooga Campaign. This involved several battles including Lookout Mountain and Missionary Ridge. Grant routed the Confederate army giving the Union control of the state of Tennessee. President Lincoln put Grant in command of the entire Union army in March of 1864. In May of 1864 Grant led the Union forces in the Battle of the Wilderness which most historians regard as a draw; in June of the same year he is defeated by General Lee at the Battle of Cold Harbor. In April of 1865 under the command of General Ulysses S Grant the Union army captures Petersburg and Richmond Virginia. On April 9th 1865 Grant accepted the surrender of confederate general Lee effectively ending the American Civil War. In 1869 Ulysses S Grant became the 18th president of the US. At 46 years of age he was the youngest person at that point in time to become president. As president Grant's administration was plagued with scandal none of which was ever tied directly to him. Towards the end of his life, dying from throat cancer and penniless, he published his memoirs entitled Personal Memoirs of Ulysses S. Grant. It became a best seller and his widow Julia received $450,000 from the publisher; Mark Twain. His mausoleum, the General Grant National Memorial, dubbed "Grant's Tomb" is the largest mausoleum ever built in North America. This mausoleum was dedicated in 1897 at which point Grant was moved from a temporary tomb.